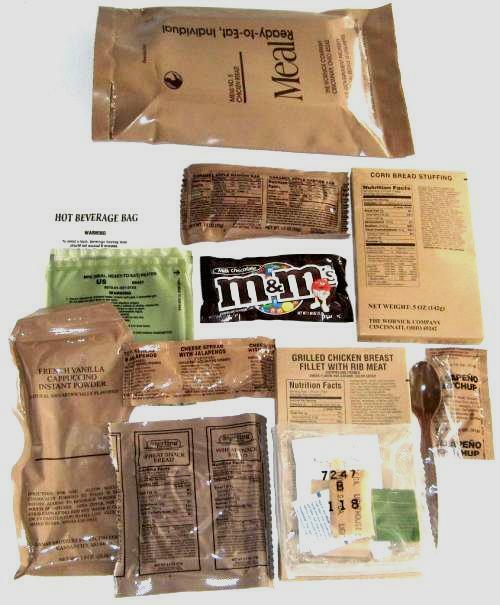 Developed by the U.S. military after extensive nutritional and long-term storage research, the modern MRE has replaced the MCI (Meals, Combat, Individual – 1980s), the lighter LRP (Long Range Patrol) rations used in Vietnam, and the C-Ration (canned) . Though far from gourmet fare, the current-issue MRE meals are a quick and tasty meal when compared to many other options. With more than two dozen menu selections ranging from meat (or meat-like) dishes to vegetarian, spicy to mild, there is something which will satisfy most, especially if the diner is hungry. The 1,200 calories of food in each packet is adequate for most people, but between meal addition of Power Bars and candy bars can be a welcomed addition and extra energy boost during trying times. Packaged in a heavy plastic bag designed to be sturdy and bug resistant, MRE meals contain an entrée, side dish, dessert, crackers with cheese spread, peanut butter or jelly, a powdered beverage (coffee, tea, sport drink, etc. 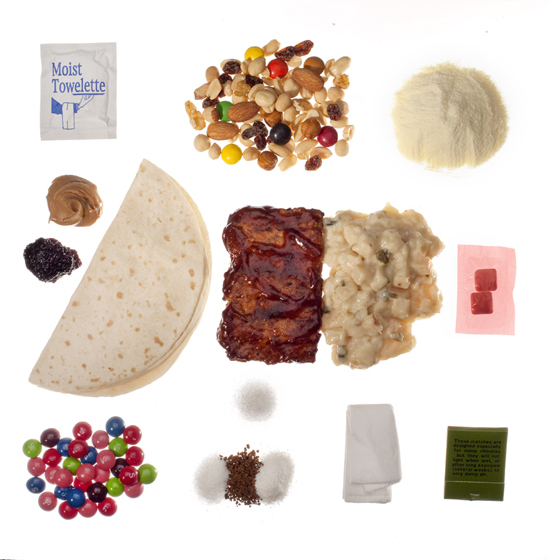 ), chewing gum, condiments (salt, pepper, sugar, creamer, and sometimes Tabasco sauce), plastic spoon, matchbook, hand-wash towelette, and a tiny packet of toilet paper. A flameless water-activated food heater is sometimes included in the package, or can be purchased separately. Three MRE disposable heaters (left in photo), and three MRE entrees (brown boxes on right), weigh just over two pounds, and occupy just over 100-cubic inches of space. Not as lightweight or compact as freeze-dried backpacking meals, the “ready to eat” aspect is what makes these a great emergency food. The “eat on the run” benefit, and not needing to add a cook pot and stove to your GO-Bag, provide a definite advantage when evacuating. For use in a standard size GO-Bag, the MRE takes too much space, but since the entrée meal and flameless heaters are available separately, carrying six meals becomes practical (8-1/4″h x 5″ w x 2-1/2″ d). Obviously, using the entree-only reduces the calorie count, but in combination with high-fiber and Power Bars, it can meet your on-the-go needs of your GO-Bag provisions. 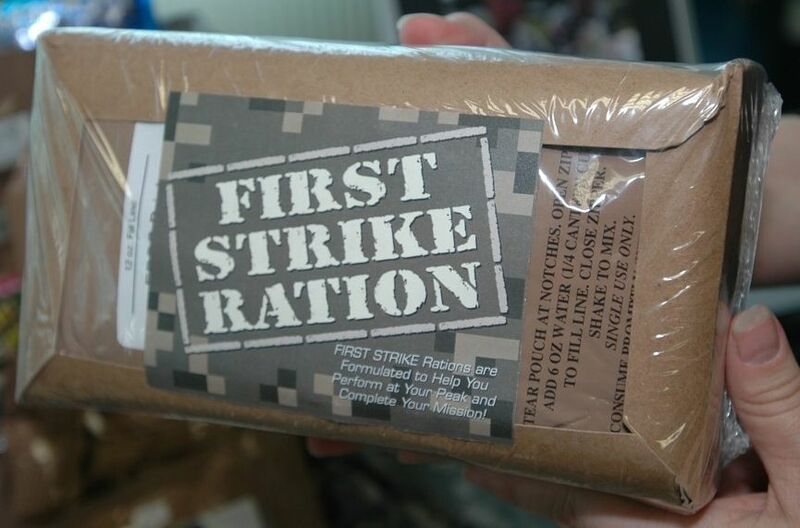 First Strike Rations (FSR) are the U.S. military’s solution to soldiers stripping down their MREs. Similar to our Go-Bag needs, soldiers often discard the MRE protective bag and items which they consider to be unessential, in an effort to reduce weight and space for field operations. Unfortunately, this newer ration is hard to find in the civilian market. FSR meals consist primarily of a sandwich similar to a Hot-Pocket, plus an energy bar, but they aren’t nearly as tasty as an MRE meal. First Strike Rations, or FSR, are the U.S. military’s response to soldiers stripping down their MREs to reduce the weight and bulk. FSR meals are not as tasty, but they are lighter in weight while increasing the important calorie count (2,900 calories vs. the 1,200 calories of a full MRE). Since these are a recent development, it’s hard to find the genuine article in the civilian marketplace. First Strike energy bars are more readily available, but not the entire sandwich (hot-pocket) meal. As a point of reference, the U.S. military calculates that an active male (age 18 to 30) will burn an average of 4,200 calories a day in a combat situation, but stress often reduces voluntary eating to 2,400 calories. The result is a negative energy balance, and this is a problem that needs to be avoided. The effect of a negative energy balance may not be a major problem short-term, such as a three day on foot trek with a GO-Bag. However, the cumulative effect over time will create a significant reduction in energy, resistance to disease, and seriously impair decision-making ability (acuity). The consumption of sufficient water (and electrolytes) will minimize this effect short-term, but sufficient water and food are both essential to an individual’s ability to operate and cope during an emergency situation. MREs are ideal as a temporary meal solution, but we recommend that you augment these meals with high-fiber energy bars. Including some freeze-dried backpacking food is a worthy addition, too, but these foods require hydration and cooking, so a backpacking stove and fuel will need to be added to your kit. For use in your at-home disaster supplies, MREs are a good way to augment what you have in your pantry, but they should be stored inside your home rather than exposing them to the temperature fluctuations and potential rodent problems of garage or shed storage. Plus, these cases can be quickly thrown into a car for emergency evacuation, they pack well, and they take less space, are lighter, and more nutritionally complete than most canned food meals. The downside of eating MREs while bivouacked or at home, is that these meals were designed for active combat, so they are high in fat and salt. Since the meals are low in fiber content, this can be desirable during a few day cross-country trek or during combat, but this leads to constipation, particularly if not active. So, if consumed during a sedentary period, augment the MRE meal with other foods which are low-fat, low-salt, and high in fiber. 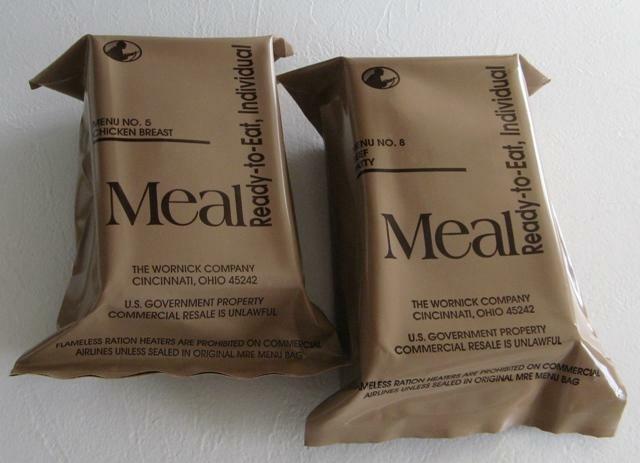 The food from an MRE is not necessarily the most attractive, but it is nutritious. Unfortunately, shelf-life of MREs is listed as three years under optimal storage conditions, but this low expectation is likely a defense against litigation rather than a literal limit. In our experience, as long as the foil packets within the MRE bag are intact and not bloated, they taste okay, and they have been stored properly, the meal will probably be eatable for 10-years or more if it has been stored at 70-degrees. However, though the meal may remain nutritious and reasonably tasty, the primary effect of age will be a decline in vitamins, so plan accordingly. Date codes on MREs are often hard to decipher. Sometimes you will find it plainly etched on the case, such as “05/10/12” which you know to mean May 10, 2012 when used by an American manufacturer. However, some manufacturers will use a different form such as “1068”. In this case, the first number “1” stands for the year (2001) and the next three numbers indicate which day of the year (365 days in a year) it was packed. So “068” would be day #68 of the year 2001…or March 9, 2001. So if a case is more than 10-years old, the date can be deceptive. Often the condition of the case, plus the date code, is the only way to differentiate between old and new product. If you are looking for emergency food supplies suitable for long-term storage, freeze dried or inert-gas packed foods are a better choice. Even ordinary grocery stored foods, such as dried beans and rice, can last more than 30-years if stored in airless food containers. This is a different purpose than the need that the MRE was designed to fill. MRE Flameless heaters are lightweight, water activated, and disposable. 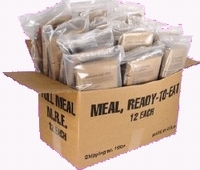 Unlike freeze-dried and dehydrated foods, MRE’s are, as the name implies, ready to eat. If you are on the go in an emergency situation, you probably won’t want to engage in food preparation. Yet, a warm meal is a huge boost to the psyche, and the important attitude adjustment which comes from a little rest and a hot meal. MREs are pre-cooked so they can be eaten cold, but the ultra-lightweight disposable heater designed for them, makes preparing a hot meal a snap. 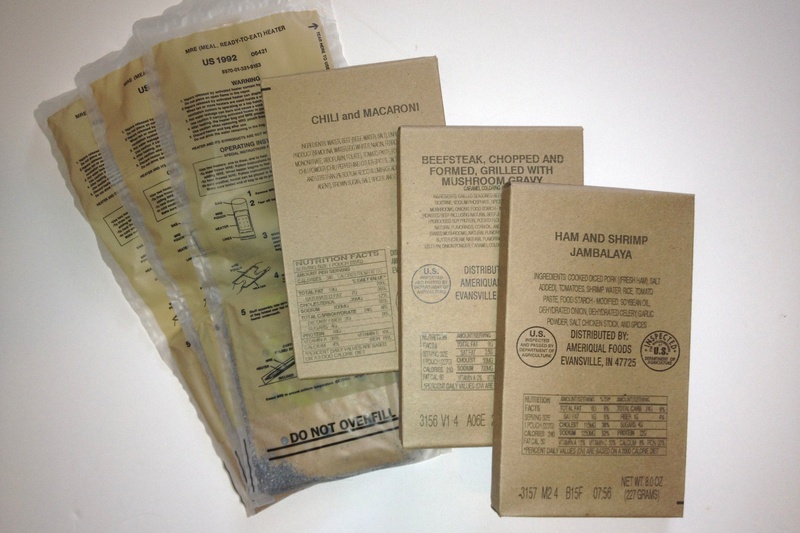 You just place your MRE entrée into the plastic bag of the heater envelope, and add water to activate. Within a couple minutes you have a fully hydrated, healthy, fairly-good tasting meal. MREs can be purchased from many retailers, but we recommend only buying them from reputable sources such as those listed at the bottom of this post. Many MREs which are sold on eBay and Craig’s List are old and absconded from the military or Katrina disaster stores. Also, new MREs should be labeled with the date of manufacture, and checking this date is essential, even when purchased from a usually reliable source. Be aware, MREs sold on “sale” are often old inventory. Meal, Ready-to-Eat entrees and heaters can be purchased separately, or as a complete MRE. Civilian packaging varies, but the peel-to-open impervious plastic-bag container is necessary for durability. Reputable manufacturers of genuine MREs are: Wornick Eversafe (illustrated in above photos) and Sopakco Sure-Pak (Highest rated in taste test and quality review); followed by Ameriqual A-Pack and MRE Star (Mediocre rating); and Menu-C MREs (Unrated). Expect to pay around $7.50 per meal when purchase by the case (12). You may pay slightly more when you purchase a case of assorted meals rather than a case containing the same menu. Posted in Emergency "GO-Bags" & Gear (Evacuation Knapsacks), Emergency - Home-Base Supplies (14-day), Emergency - Vehicle-Based Evacuation, Food: Emergency & Long-Term Food Supplies.